If one of your child’s primary teeth is knocked out, don’t try to replace it. The permanent teeth will be emerging soon enough. However if your child has broken a tooth you should consult your dentist as soon as possible. Injuries to a child’s primary teeth may have an impact on the developing permanent teeth, which could emerge with white marks or deformed crowns. The younger your child is when the incident happens, the more serious the potential complications. Unfortunately there is nothing you can do about this once it has happened, so the best thing you can do is to try and prevent accidents from occurring in the first place. Make sure your children know they should be careful with their teeth and those of their playmates. And when they’re doing potentially risky activities like cycling, skating or skateboarding or sports like hockey, rugby or karate they should ideally wear a helmet or mouth protector. If one of your child’s permanent teeth has been knocked out, don’t panic. There’s a good chance it can be saved. If it has dropped on the floor find the tooth and, holding the crown (the white part), wash it in cold running water. You or the child can then try to put the tooth back in position. Once it’s in place they should bite down on a handkerchief to hold it in while you arrange to get them to a dentist – ideally within the next two hours. If you can’t put the tooth back in, keep it in a glass of milk or salty water until you can get to the dentist. Alternatively ask your child to very carefully hold it in their mouth, between the cheek and the gum. Once the tooth has been successfully replanted ensure your child takes extra care with cleaning their teeth and avoiding sugary foods for several weeks, until the tooth is firm in the jaw. 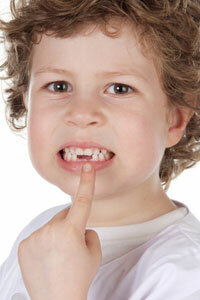 If your child has broken one of his or her permanent teeth you should consult a dentist immediately. The sooner you see a dentist the greater the chances of saving the tooth. Keep any loose pieces in a glass of milk or water until you get to the dentist. With modern treatments it will often be possible to glue the pieces together, or just replace a missing portion using composite bonding.